We know you care about the quality and safety of the food you prepare and eat while in China. 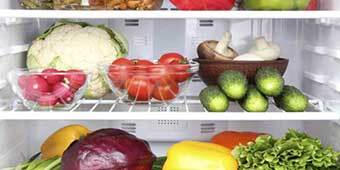 But the way you store it in your refrigerator could be undoing all of that good! If your fridge sounds anything like this - last week’s leftovers, unfinished takeaway, empty bottles of hot sauce, moldy cheese - it might be time to take a good look at what’s inside and give it a good spring clean. Don’t worry – it’s easier than you think! The first thing you need to do is to empty all the contents out onto the kitchen bench. There’s two very good reasons for this: one, you can see exactly what items you have that need to be kept or thrown away; two, you need an empty fridge to give it a good old scrub. Sort through the contents and throw away any items that have passed their use-by date. And do this quickly – you don’t want your items sitting outside for too long! Wipe down each shelf – remove them from the fridge first if that makes things easier - and make sure all other surfaces are similarly cleaned. If there are sticky, stubborn marks, use more boiling water to dissolve the stains and wipe them again with your cloth. Once finished, you can give everything a vanilla essence wipe down. Vanilla essence helps to absorb odors so add a few drops to your damp cloth and wipe over every surface. Don’t forget to give the outside a wash as well. And now you can organize the contents of your fridge! Different products have different storage requirements, but in order to increase the longevity and maintain the quality of many food items, proper refrigeration is extremely important. Just like people, foods have a certain temperature at which they feel most comfortable. Knowing what this temperature is, and storing your food appropriately, will help keep it fresher and healthier for longer. Up Top: The most accessible part of the fridge, ideal for packaged and dry foods and things you need easy access to, like drinks. In the Middle: The temperature is most consistent here so it’s the perfect place for your dairy items like milk, cheese, yogurt and spreads. Cooked leftovers will also be happy here. Down Low: The coldest part of the fridge. Store all uncooked meats here so if any juices escape they don’t drip down and contaminate other foods. Drawers: Most of us already do this but the drawers are ideal for storing fruit and veg as they’re less humid than other parts of the fridge. Door: Door temperature fluctuates quite a lot so avoid putting milk here. Instead store condiments, sauces, wine and other non-perishable items. Temperature: The ideal fridge temperature is around 2°C. Remember - cleaning out your fridge once a month will make the job easier on yourself and help prevent the build-up of bacteria and other undesirable odors. What’s the worst thing you’ve ever found in your fridge while in China? Leave a comment below. Contributed by FIELDS (www.fieldschina.com), your online grocery store in Shanghai. FIELDS stocks fresh and organic fruit and veg, imported and domestic meat, plus the brands from home that you love and miss. Fill your fridge at FIELDS and get 15% cash back* on your first order in August. Order online from the comfort of your home and get same day delivery for orders placed before 5 pm and free delivery for orders over RMB 200. Pay by cash or card at your door or online using PayPal, WeChat or Alipay. *Offer available to all customers, new or seasoned, until 31 August. 15% cash back in credit. Concerned About Food Safety? You Should Be. Rule number 1 when advertising on a website: know who your target market is. Judging from the 'posts' and 'spams' that have appeared recently on ECC, the target market is pre-teens or early teens, not experienced travelers. If you consistently have posts or such obvious spams such as this one, the people who you wish to attract will leave. I know times are tough ECC, but this post on 'cleaning your fridge' is just laughable. And to post twice on the same page is just amateurish. News flash: All laowai know how to defrost a fridge. Is this an article for retarded people getting ready to be sent out into society? If you don't know how to clean a fridge then you are either 12 years old or you have an extra chromosome. Can't wait for the next article. Maybe you could do one of the following. Ovens are hot - don't touch them. Your mouth - food goes in here. How to wipe your bottom in three easy steps. There's no please in some people.